A true gem of a pattern described as an "angora tippet" from the early 1950s. Originally knitted in Patons Beryl Angora 4ply wool, this version uses a mixed fibre mohair yarn which knits to a 4ply tension. With No. 8 needles, cast on 338 stitches loosely, and work 4 rows stocking stitch starting with a knit row. **Next (eyelet) row: K2 *wool forward, K2tog. ; repeat from * to last 2 sts, K2. Make hem - on next row by knitting 1st from the needle together with 1st from the cast-on edge. Work 7 rows in stocking stitch, starting with a purl row. Repeat sections from ** to ** once more. Make another hem on the next row, but this time instead of knitting the sts together with the cast on row, you pick up and knit into a previous row as follows:- taking a spare double pointed (or circular) needle, pick up 338 sts along back of work, 4 rows below the row of eyelet holes; now knit 1st from the needle together with 1st from the spare needle. [Editor's note: this can be tough as the picked up sts are very tight. I used one double pointed needle and picked up the 338 sts in sections as I went along the row]. Next row: wrong side facing, K4, * P30, K30; repeat from * to last 34 sts; P30, K4. Repeat these 2 rows 6 times more and then the 1st row again. [Editor's note: If you need to lengthen the cape, here would be the time to consider it]. Next row: right side facing, K4, (K2tog, K13) 22 times, K4. *Next row: K4, (P28, K28) 5 times, P28, K4. Repeat from * once more then 1st row again (316 sts). Next row: K4, (K2tog, K12) 22 times, K4. *Next row: K4, (P26, K26) 5 times, P26, K4. Repeat from * once more then 1st row again (294 sts). Next row: K4, (K2tog, K11) 22 times, K4. *Next row: K4, (P24, K24) 5 times, P24, K4. Repeat from * once more then 1st row again (272 sts). Continue in this way, decreasing 22 sts on next and every following 6th row, (remembering you will be working 1st fewer after the K2tog on each decrease row) until 96 sts remain. [Editor's note: if you need to lengthen the cape, consider it again throughout these decreases; instead of decreasing every 6th row you could decrease on the 8th row a couple of times - adding 4 exra rows - or as many times as you need.]. [Editor's note: another chance to lengthen the cape if you have a swan-like neck!]. break wool and leave sts on a spare needle. With No. 11 needles, cast on 96 stitches, and work 4 rows stocking stitch starting with a knit row. Make a hem on the next row, exactly as given for the first hem on the lower edge. Work 7 rows in stocking stitch, starting with a purl row. Repeat sections from ** to ** once more. Now make a second hem on the next row, exactly as given for the second hem round the lower edge. Next row: wrong side facing, K4, (P8, K8) 5 times; P8, K4. Place the needle with the neck sts and the spare needle with the body sts together, with right sides (facing each other) together, and cast off the two sets of stitches together. [Editor's note: to cast off together, you knit together 1 st from one needle, and one from the other, and pass the knitted sts on the RH needle over each other as usual for casting off]. Press the cape only very lightly on the wrong side under a damp cloth. [Editor's note: you don't want to flatten out the pattern sts or the wool texture]. Work a row of double crochet (that is, US single crochet) up both front edges, then a row of slip sts, taking care to leave the picot hems free. Sew on hook and eye below the hems at the neck edge on the wrong side of the work. Sew on two decorative buttons at the neck edge, as seen in the photograph. 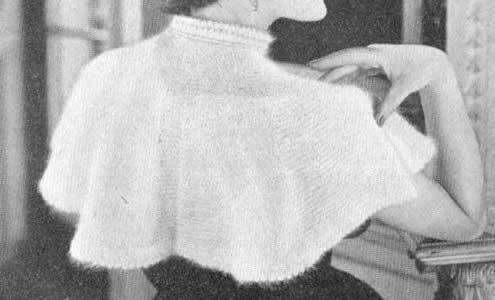 The detail shows the mixture of stocking stitch and garter stitch gored panels, which gives the shoulder cape such a perfect drape. 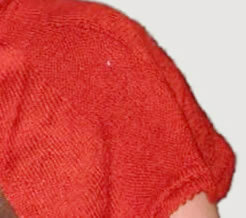 The hem is formed by a double folded picot edging, which is reproduced at the neck. Original pattern calls for 2 oz angora wool. This equates to just over 50g. One pair each of number 8 and number 11 needles. One crochet hook, number 13. Two decorative gold buttons, and hook and eye for fastening at the neck. 28st to 4 inches (10cm) on No 8 (4mm) needles. One size fits all! However - I did lengthen the cape by about one inch overall, as I found that although the tension was as stated in sts per inch, the length seemed shorter than depicted. I used a vintage wool from Pingouin called Volutes (80% acrylic 20% mohair), which I chose from my stash mainly for its rich colour. It knits to a tension of 23sts x 34rows on No. 11-12 (3-2½mm) needles, thus I knitted the cape on smaller needles than the pattern stated to achieve the right tension. 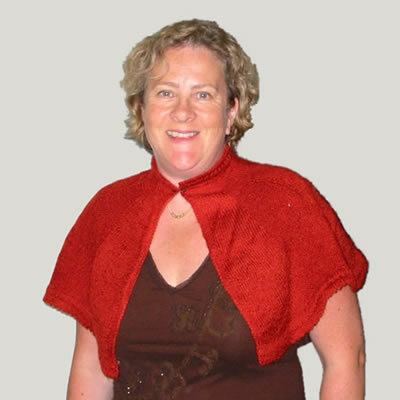 I think the cape really needs to be knitted in a true luxury yarn, such as angora, or cashmere. Rowan's Kidsilk Haze could be suitable but the smallest tension on No. 10 needles is quoted as 25sts to 4in.